The Western Force are currently competing in the NRC for 2018, coming second to the Drua and guaranteed a top four finish. Something that is undecided, however, is next year’s World Series Rugby. Get a move on Twiggy – or if you have, just tell us about it. Andrew Forrest isn’t known for mucking around, so maybe this is more about communicating with him to see what’s going on. When you stop and think that, the only real messages we’re getting regarding the new comp are rumours to WA media with no officialdom about them, it leaves so much up in the air. Reports suggested that during halftime of the Panasonic Wild Knights game, all details about the makeup of the new tournament would be revealed on the TV coverage. However, the only info we were given was that a team would be based in Western Sydney, in a nod to the potential in the area. In recent days however, to-be coach Darren Coleman has moved to Gordon for the 2019 Shute Shield season, declaring to Fox Sports that he understood that the (Western Sydney) team won’t be included next year, in a move which ensures all plans are still very much still to be confirmed. 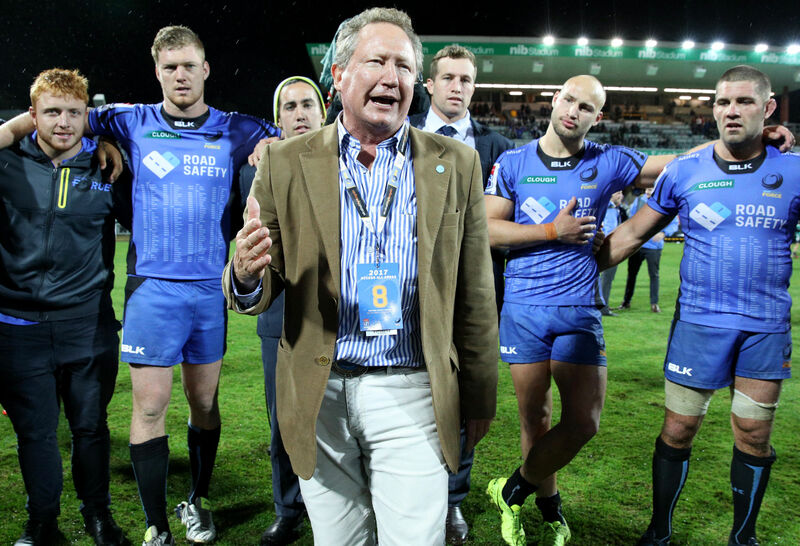 Rugby Australia were relentlessly slammed for their communication (or lack thereof) in the lead-up to the Western Force being culled from Super Rugby. With this competition due to begin in just five months, especially since it’s just been given World Rugby approval, surely we should know more about it? Rule changes aren’t working – let’s go radical. The 60-second limit on scrums, as with the wacky lineout variations, were basically non-existent. Trying to keep a scrum – where you need to assemble 16 forwards, set them up in the manner and achieve a contest – is never going to happen within just one minute. As for lineout amendments – isn’t that what quick throw-ins are for? Let me put this out there. Time-off at scrums, and contested lineouts, also after conversions. To stop matches going forever, cut games to 30-minute halves. Only 34 minutes of gametime were averaged in stats by World Rugby at the last RWC, surely we can cut out some of the wasted time? “But that’s what WSR was doing already” you say. Afraid not. Only 36 minutes of ball in play time (two minutes more) was averaged over this year. Also, cutting matches to 60 minutes would certainly keep the Rugby Union Players Association onside, as well as luring NH big names, with less threat of burnout. Think outside the box. No, really. The number of potential team locations which have been offered up are mind blowing. From Sri Lanka to Hong Kong, Hawaii to China, there’s just been a fair few rumours thrown around about where this comp will come from, with NZRU CEO Steve Tew involved in discussions a few weeks back. Let me say this. Australia needs more rugby, not less. Forrest has declared he wants rugby to be the biggest sport in Australia, if so, you’d think and hope he’d base one side other than the Force inside the borders. New Zealand has also been thrown around, as a country with depth for more than five Super teams, no doubt. In an eight team comp, there’s room for a Pacific footprint, also an Asian feel (Japan 2019, etc etc), and room to spare. There’s only one place Australian Rugby is going to get innovation from, this competition, and who knows, maybe Tasmania or South Australia is a good place to start. Roarers, what are your thoughts? I’d love to hear some more discussion about this whole venture, which could well be a game changer.